Here is an article that ran in Cycle News covering the fall 2008 Thunder in the Sand. For many on the Jersey Shore, the beginning of October is not the time to go to the beach. 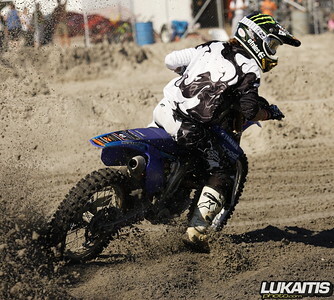 That is of course unless you race motocross, then it is the perfect time to hit the beach. Not with your surfboard but with your bike. You see October is time for the Thunder in the Sand. The event is held twice a year, once in the summer and once in the fall and features two days of racing with one moto in each class each day. Camping right on the beach is encouraged and many families make a great experience out of the weekend enjoying racing all day and boardwalk amusements all night. Classes are held for everyone from the youngest peewee riders right up to the vet class but the races everyone comes to see are the Expert class motos. Unseasonably warm temperatures added to the turnout and this year the fans even got a special treat as defending West Coast Supercross Champion Jason Lawrence was in town and he was racing. Lawrence, who hails from nearby Estell Manor NJ, was in town and spending some time with friends while preparing for his title defense and his New Jersey fans were excited to see him ride. Jumping out to an early lead in both motos Lawrence put on a riding clinic showing the rest of the field the fast way around the Mark Hufnagle designed and prepared track. The summer off certainly hadn’t slowed Lawrence down. Finishing behind Lawrence in both motos was Fox/Von Zipper backed Adam Blessing. Riding a borrowed RM250 two-stroke the Toms River NJ native tried to keep Lawrence in sight but he just didn’t have enough to catch the Supercross Champion. 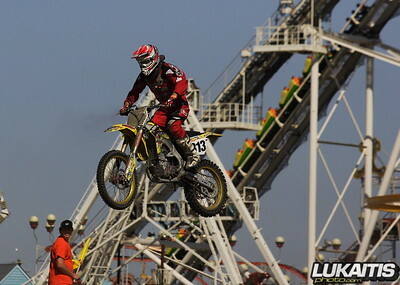 Finishing third in both motos was another Suzuki. This one was the Ocean County Powersports / Bad Boy Energy Drink-backed Ronnie Stewart. So it was Lawrence, Blessing and Stewart 1-2-3. Blessing redeemed himself in the 450 Expert class. This time aboard his familiar Honda, Blessing used 2-1 motos to take the overall ahead of the 1-3 scores of Teddy Grant and the 3-2 scores of Stewart for third overall. Stewart was an ironman for the weekend. 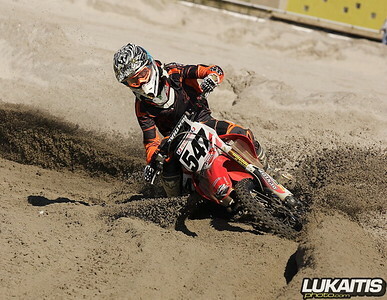 In addition to the 250 and 450 Expert classes Stewart also rode the Collegeboy class and was rewarded for his efforts with 1-1 scores to take the overall. Great racing and great times were enjoyed If you are looking for something different then the average motocross why not try the Thunder in the Sand? Your next chance comes next summer. Check out their website at www.thundermoto.com for more information.